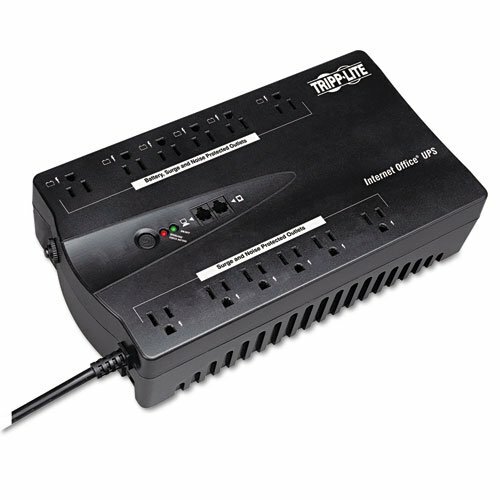 UPS system delivers battery-derived AC output during blackouts and brownouts, providing time to safely shutdown computers and other sensitive electronics. Widely spaced outlets accommodate large transformer plugs without blocking outlets. Built-in TEL/DSL line surge suppression protects modems, fax machines and phones. USB connectivity and free downloadable PowerAlert monitoring software enables unattended, automatic file save, software close and safe system shutdown. Space-saving, ultra-compact housing fits almost anywhere. Audible alarm and front panel LEDs offer status information regarding line and battery power operation. System VA: 900 VA Backup Time at Half Load: 10 minutes 450 Watts Automatic Voltage Regulation AVR: No Battery Recharge Time: 4 h.